The Use of Open Source is Growing. So Why Do Organizations Still Turn to SAS? Should your company use commercial analytics software or open source to meet business needs? What’s best when using Hadoop? These and other questions were answered in a recent session at the 2014 Hadoop Summit presented by Brian Garrett, Principal Solutions Architect at SAS Institute Inc. In his presentation titled, “With the Rise of Open Source, Why Organizations Still Turn to SAS,” he explains why the best choice is finding the right balance of SAS enterprise-class analytics solutions and open source solutions. Why? 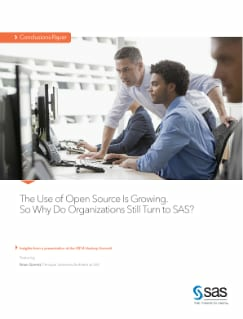 Because SAS is optimized for operational and production analysis and includes integrated capabilities for data management and more, and open source can quickly bring new analytic algorithms to market. Garrett explains how these technologies can co-exist and highlights recent SAS software enhancements that allow analysts to incorporate R algorithms into analytic processes as part of a comprehensive, enterprise-class SAS analytics platform.